The keystroke is mightier than the sword, was the message that social studies teacher Gideon Sanders of Washington, D.C.’s McKinley Technology High School helped send last October.? ?While 200 angry McKinley Tech students took to the streets to protest the loss of 15 of their instructors and counselors after the layoff of 229 D.C. public-school teachers (see video HERE)—and a scuffle with police resulted in the arrest of one student and one adult—11th graders Aaron Kitt and D’Angelo Anderson took to their screens. 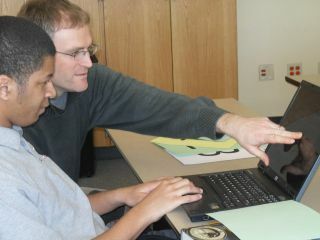 The students were introduced to blogging as part of a plan to meet McKinley Tech’s goal of becoming the highest-performing school in the nation by 2013. Sanders, an advocate for hands-on learning, uses the it’s learning individualized-learning-platform blogging forum as a regular outlet for his students’ thoughts and insights about their daily work. This addition to the usual roster of resources pumps relevance into his classroom lessons—the platform is accessible via devices such as Xbox 360, Wii, PlayStation, and cell phones—as well as acts as a tool to handle matters affecting students’ lives outside the classroom. 1. Make accommodations available for all students to ensure access. “Most students have cell phones with Internet access,” says Sanders. Designating time slots and making machines available in the school computer room or library, however, or programming blogging time within the classroom schedule, prevents “The dog ate my blog” excuses and keeps students without home access from being excluded. 2. Create blog policy guidelines within the classroom. By doing so, teachers can also jump-start critical thinking about the responsibilities of publishing online content and what might cause problems within the classroom environment. Students made part of policy building take ownership of the rules, increasing the likelihood of their respecting and following them. Teachers can include a civics lesson about First Amendment cases and recent court rulings regarding student bloggers. 3. Determine the goal of writing the blogs as well as their intended audience, and maintain appropriate security measures toward that aim. Some schools may want students to get a taste of the real world by allowing public access in order to highlight their work and ideas; others may prefer a private setting that protects students and offers a haven in which they can express their thoughts without fearing that their words will live forever. To offer personal security, many schools opt to use first names only and suggest choosing as an avatar a photo of something that represents the student rather than an actual likeness. 4. Connect with other teachers to create interdisciplinary projects, or use the blogs as a teaching lesson in collaboration and constructive criticism. Offer meaningful discussion starters tied into the day’s lesson, but reward out-of-the-box thinkers with incentives to discover related topics that speak to their interests. Reward thoughtful comments as well as original posts. 5. An Apple (or PC) a day keeps the loss of interest away. Create good blogging habits by encouraging daily interaction to promote an active community. The best posts can be cached to add flavor to student e-portfolios.